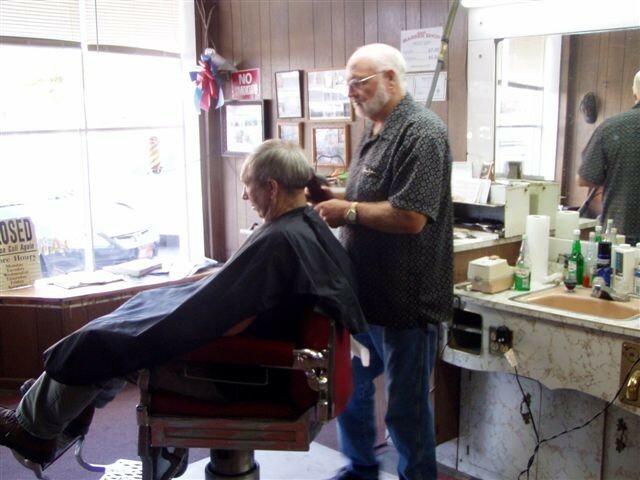 The Model Barber shop has been in business since the 1920's and is the only business on the square that still continues to operate out of the same building offering the same services as it did when it began many years ago. a computer. To me, there's no comparison. Those days, even though much harder than we know today, seemed to have been lots more enjoyable. today to offer the same type service it started out with. Do you know what type of business I'm referring to? In case you haven't figured it out, it's the Model Barber Shop. 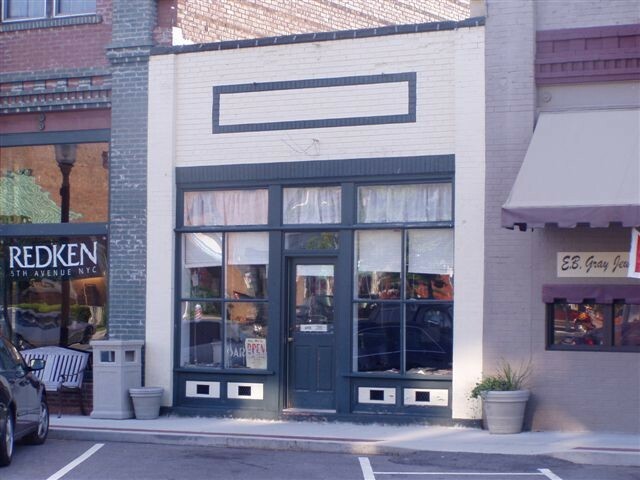 According to information provided to me by Raleigh Needham about the shop’s early history, Mr. Jim Myers owned the building in the1920's. Mr. John Poore was the first barber to work out of the Model Barber Shop. The shop had as many as five chairs at one time with a barber per chair. The front chair was always occupied by the owner/manager. On Saturday nights, a hoedown with live music was held in the barber shop, and was enjoyed by folks until as late as 1:00 a.m. in the morning. It was the custom then for stores around the square to stay open on Saturday nights until 10:00 p.m. The late hours were observed to accommodate patrons who, after being in town all day Saturday, often went to the Dixie Theater to watch a movie in the late afternoon, and following movie, did their shopping. At one time, the Model Barber Shop and the Palace Barber Shop both included shower stalls. The price for a shower was .15 cents. A portion of the Model Barber Shop included a beauty shop once operated by Mrs. Ova Zachary and later, by Ms. Orpha Halsell. The cost for a shampoo and set was .25 cents. A permanent was a pricey $5.00, but if a lady only wanted curl in just the ends of her hair, the charge was $2.50. Just beyond the beauty shop, a dry cleaners was operated by Bob Little and could be entered through the back alley behind the barber shop. Crabtree shined shoes as did Roy McKinney and Lans Allen. Lans was a very talented musician who could play just about any instrument known at that time. Raleigh remembers having Lans try and teach him, along with Elmo Swallows, Roy Hugh Upton, and Claudie B. Smith to pay the guitar, but none of the four of them ever learned to play. Coal was the source of heat in the Model Barber Shop to begin with, but was later converted to an oil stove. The little oil stove isn't used anymore, but still sits near one corner of the shop, along side the shoe shine stand. Roy Hugh Melton has been the sole proprietor of the Model Barber shop for the past 38 years. For the past 38 years, Roy Hugh Melton has cut hair at the Model Barber Shop. He began working alongside Mayford Boles in the 1969. Previous to that, he had been working in a barber shop in Cookeville. Some other barbers who worked with Mayford prior to the time Roy Hugh started were Addison Walker and Delphus Savage. Just for the sake of remembering how much things cost years ago, Bill Crabtree posted a sign on the back wall of the barber shop that lists the price of each service offered during the period of time when he shined shoes there. The sign reads: "Hair Cut - 25 cents; Shave - 15 cents; Bath - 25 cents; Shoe Shine - 10 cents; Suit cleaned and pressed - 75 cents." According to Roy Hugh, barbers are prone to heart attacks. He mentioned several names of barbers he has known who lives were cut short because of a heart attack. Armel Maynord and Mayford Boles were both included in those names. The barber shop still has an original light fixture in the ceiling and a barber shop sign that once hung outside stands inside. It would be interesting to know what some of the older barbers who once stood there cutting hair all day would think of the modern vacuum system the shop uses installed when Roy Hugh became the sole proprietor. I’ll just bet they would marvel over the that improvement as well as others that have been made since the earlier days. It’s too bad we can’t roll back the clock to a time when a hoedown was just about to crank up at the close of the business day. I’ll just bet in addition to a shave and a haircut, plus socializing with friends, listening to some mighty fine music rounded out a busy Saturday spent on the square in Livingston. Those days are long gone but remain as some wonderful memories for many.